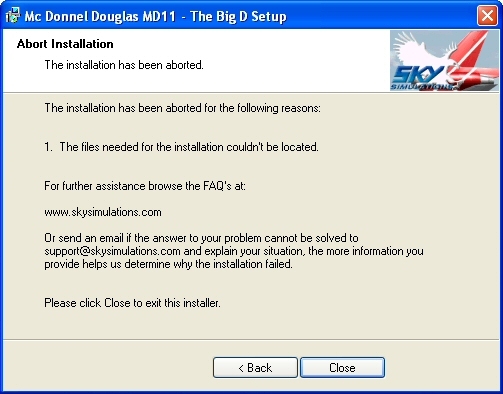 Mc Donnell Douglas MD11 "The big D" Installation issues. If you get this message, it means that your key has been used for more than 3 times for that flight simulator version. ..:: Flight Simulator 9 ::..
..:: Flight Simulator X ::.. The setup needs essential files in order to successfully install, so if for any reason you changed the location manually or renamed the flight simulator folder, you need to update this key within windows registry. Please use the download tool again to get the latest installer available, some of the parameters have been changed in order to comply with international versions of Flight Simulator 9 and Flight Simulator X. This version was uploaded on February 8th at 0900 UTC. ..:: How to fix the windows registry ::..
You need to download the file that matches your flight simulator version and extract the contents of the zip file to a temporary folder, for example to desktop, once you have the contents extracted, you need to open de KEY file with a text editor, for instance NOTEPAD, and modify the content to match the correct path to your Flight Simulator folder, once you achieve this, you then proceed to save the file and close. After you save the modifications double click on the KEY file and accept the insertion of a new key to the registry. If everything works as it should you are now ready to install. If for any reason you get the same error message, please download again the installer as indicated above. ..:: FS9 FIX ::.. ..:: FSX FIX ::.. If for some reason you get this message while trying to install please use one of this tools or both to clear any possible garbage on the windows registry. ..:: FS9 ::.. ..:: FSX ::..